The Napier Jewelry book is a visual encyclopedia of Napier Costume Jewelry. It is the most comprehensive book on vintage costume jewelry. 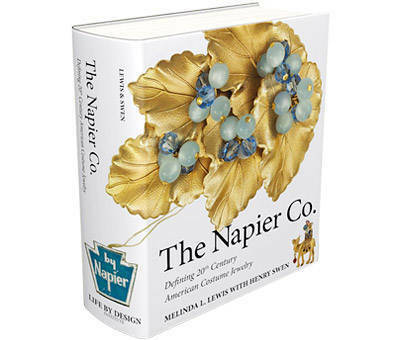 This jewelry book tells the heretofore untold and phenomenal story of The Napier Co.’s inception, development, flowering, and ultimate success. It chronicles the history of its management, manufacturing, marketing, and most importantly, the unparalleled beauty of Napier fashion jewelry. With approximately 4000 pictures of Napier jewelry history and over 250,000 words of text and descriptions, you will be taken step-by-step, decade by decade, through the development of the Napier style. As a collector, you will learn to recognize the findings, materials, and designs to appropriately circa-date the Napier jewelry in which you are investing. As a lover of vintage costume jewelry, you will enjoy the drama and excitement of the trials, tribulations, and breakthroughs at each stage of the Napier journey. In the end, you will have a deep and lasting appreciation of the romantic story infused into the metal, gemstones, crystals, cabochons, and elegance of each piece of Napier jewelry that you own or are considering owning. Be sure to click our shop link to select your favorite Napier jewelry from our carefully curated collection of fine vintage jewelry. The perfect one-stop-shopping for the vintage jewelry collector. With more than 100 pieces and more added weekly. The Napier Jewelry book is a visual encyclopedia of Napier Costume Jewelry. It tells the heretofore untold and phenomenal story of The Napier Co.’s inception, development, flowering, and ultimate success. It chronicles the history of its management, manufacturing, marketing, and most importantly, the unparalleled beauty of Napier fashion jewelry. With approximately 4000 pictures of Napier jewelry history and over 250,000 words of text and descriptions, you will be taken step-by-step, decade by decade, through the development of The Napier Co. This book is one of the leading books on the history vintage costume jewelry offering industry specific information not found on other costume jewelry books. It’s the most complete, picture perfect book in the industry and will be used as a model for future writers. Beautifully photographed, meticulously researched, and clearly written, it reflects unfaltering attention to every detail of quality printing and production..